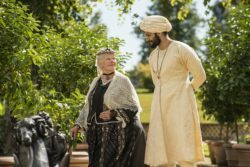 This is a British biographical drama film based on the book of the same name by Shrabani Basu, about the real-life relationship between Queen Victoria and her young Indian attendant Abdul Karim. Directed by Stephen Frears, with Judi Dench, Ali Fazal, Tim Pigott-Smith, Eddie Izzard etc. In cinemas from 25th January at Bunkamura le Cinema, etc.